** In case you haven't noticed, this is a few days late because I spent the better part of a weekend driving to see Civil War LARPers. Only they go for the respectful name of "re-enactors." Sounds legit when they put it that way. ** This past week the world was in post-SDCC malaise. Everything big comic-wise was announced leading up to SDCC but there was one big piece of news announced early during San Diego that has surprisingly not gotten a lot of play. On the Thursday of the big show, it was announced that B.P.R.D. cowriter John Arcudi would be leaving the Mignolaverse books later on this year. Arcudi has a 10+ year run working with Mike Mignola on The B.P.R.D. and various other related books and helped architect the end of the world with Mignola. With all of the writing for the past 10 years credited to both Mignola and Arcudi, it's sometimes tough to tell exactly what's Arcudi's doing and what's Mignola's. At a very high level, Mignola seems to be the overall vision setter of everything that happens while Arcudi is the one that makes it happen. Arcudi's maybe even been the sensible one who has kept everything focused and moving forward. It will be weird to see B.P.R.D. books without Arcudi's name on them. Along with the news that Arcudi is leaving, announcements were made that Chris Roberson and Paolo Rivera would be joining Mignola on a new Hellboy and the B.P.R.D. comic. So that's exciting as well. 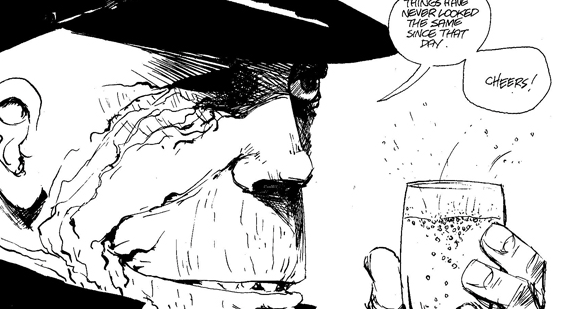 **Eddie Campbell talks to Paste about the first omnibus of his Bacchus series that was just released by Top Shelf Comix. If you've seen his Alec omnibus The Year Has Pants, this new Bacchus collection is just about the same size. Despite the mythological trappings, there’s plenty of the ordinary in “Bacchus.” At its heart the title is mostly about two men-Bacchus and Simpson-drinking, philosophizing, traveling and swapping stories. Simpson in particular speaks with a hyper-literate specificity that seems to suggest he might be Campbell’s surrogate in this world, but Campbell says there’s plenty of himself in Bacchus too. ** After this week's reveal of Marvel's hip-hop variant covers, David Brothers wrote about the poorly thought-out execution of this particularly when looking at Marvel's track record of hiring black creators. He also links to an related and enlightening comic by Whit Taylor at The Response. Shawn Prior also talks about this move by Marvel, framing the conversation around artists that it would have made sense for Marvel to recruit for his campaign. These creators spoke to an audience that felt alienated by most of the geek crowd when they went to comic cons or comic book stores because of their love for Hip-Hop and the culture. It helped others relate and bridge a gap with others between Hip-Hop & comic books. It brought folks together. There was a love in the creation of these covers. And all the covers these artists created MADE SENSE. There was a rhyme, reason, and purpose behind every piece of art and cover. ** Berkeley Breathed is doing more Bloom County!! He's publishing on Facebook so I had to back off of my usual stance of following creators or celebrities on that system because, come on, this is more OPUS!!! And it's not like Breathed hasn't tried to come back to these characters before, usually to less than spectacular results. But his cartooning hasn't missed a step yet. Looking at his characters, his line, his pacing, you'd think that it's 1985 again and Breathed is having a lot of fun with that as well. Gary Tyrell writes about the influence of Bloom County on webcomics. ** Comic writer Van Jensen has an interesting insiderish view of San Diego Comic-Con International. I talked with a couple of guys who work for a company that creates geek-centric board games, and they came to Comic-Con to scout it out to potentially set up a booth in the future. Their product would fit in, without question. But they said they’re dead set against tabling at Comic-Con. They see the show as too big for its own good, so busy that everyone who isn’t an A-list star gets lost amid the noise. Comic conventions are in a fascinating place right now. You've either got the big gargantuan shows that are more about culture and business or you've got the art festivals that are about a different type of comic than what Reed Exhibitions or the San Diego organizers seem concerned about right now. In Chicago, we have two very different shows in Reed's C2E2, a SDCC wannabe (actually more of a NYCC wannabe) and CAKE, very much a gymnasium, get-the-gang-together show. We've also got a Wizard World, but the less said about that, the happier we'll all be. There's going to be a lot of talk about the sustainability of these type of shows or what these big types of shows are even about. But as comics continue to be a driver of pop-culture, it's concerning to see comics become less and less important to these kind of shows. And maybe it's time that we embraced that. Look at the Eisner winners this year. It's a list that doesn't look like anything else that came out of Comic-con. It's an inclusive list. It covers a wide range of types and styles of comics. It's not full of books that are created just to be movie R&D, even if there are a few comics there that already have movie deals. Even as types of comics become more mainstream because they're the types of comics that everyone is seeing on their movie screens and TVs. The Eisners, celebrating the "best" of comics as much as any awards can, celebrated the fringe of comics and that's what we should be really looking at right now. That fringe today is what can be defining the mainstream of tomorrow.